Cisco has posted a new R&S lab checklist over on the Cisco Learning Network. If you are prepping for the R&S you are going to want to read through it. They also have them up for Security and Voice. 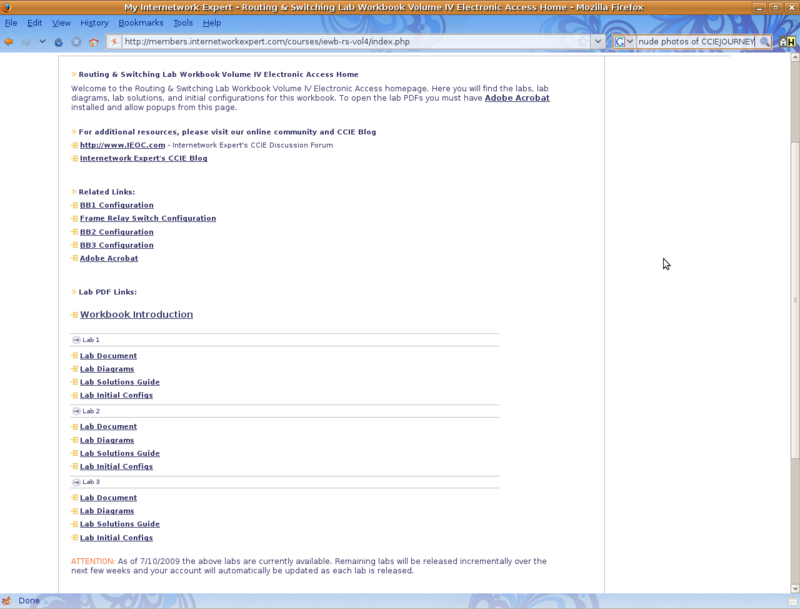 You will need a learning network login to get access to it. VRFs, or VPN Routing and Forwarding instances, are most commonly associated with MPLS service providers. In such networks, MPLS encapsulation is used to isolate individual customers’ traffic and an independent routing table (VRF) is maintained for each customer. Most often, MP-BGP is employed to facilitate complex redistribution schemes to import and export routes to and from VRFs to provide Internet connectivity. However, VRF configuration isn’t at all dependent on MPLS (the two components just work well together). In Cisco terminology, deployment of VRFs without MPLS is known as VRF lite, and this article discusses a scenario where such a solution could come in handy. I wanted to share a review we received today at IPexpert from last week’s class. If you are gearing up for your R&S lab, and are looking for an awesome experience, you should go find Jay on Twitter @WannabeCCIE an chat him up about the class. Obviously, I teach the class so I might be a tad biased : ) I just wanted to share because we are all excited about our current complete product line over at IPX. Are the open ended questions worth the cost of both 360 sessions at $3995 a piece to skip them? To me the answer is no. I should be able to pass them anyways as I did on my first attempt. Now the big question is will the OEQs be coming off soon and is this a quick grab for the 360 program before they do? 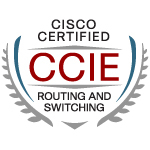 Beginning April 1, 2010, Cisco will allow Cisco 360 Learning Program students who attend a Cisco CCIE® Routing and Switching or CCIE Voice workshop to request a waiver and skip the Core Knowledge Section of the CCIE lab exam. All waiver requests must be approved by the workshop instructor. No end date for the Core Knowledge Waiver has been announced, but Cisco will provide at least 60 days’ notice before discontinuing the waiver. During a Cisco 360 Learning Program workshop, students complete a series of performance assessments that demonstrate their understanding of the CCIE material and serve the same purpose as the Core Knowledge section of the exam. Therefore, Cisco 360 Learning Program students who use the waiver will not be required to type out answers to the Core Knowledge questions and will be allowed to move immediately to the next section of the lab exam. I had a chance to sit in on a free demo of NMC’s new twenty one week mentoring session that was delivered through a Webex session this past Friday. The class was very interactive with Bruce almost pushing you to answer his questions to the class. You felt as if you almost had to participate or you were going to be sent to the corner 😉 You felt as if you were really part of the class. The network diagram came through really clear, along with the lecture on the network topology we were using as well. The sessions are done over twenty one weeks on different days, depending on which session you choose. If you miss your session you have the choice to watch it recorded or attend it during another session. From what I saw, each session is ninety minutes long. I would almost have to guess that depending on the topic that some sessions would go longer. I am not sure you could hammer out all of BGP in 90 minutes. From what I saw it was a pretty good session, and a little different way of lecturing than what I am used to. Where it fits in someone’s training is going to be up to them. One thing I wasn’t sure on is if you could follow along in the class if you weren’t working on the Cisco 360 workbooks. I am sure anyone could follow the topics, but the networks they are running on might be a bit unfamiliar. It will be interesting to see if any of the other training vendors follow suit and start to offer anything similar. The biggest appeal to someone in my position is that they are once a week on the same day. This is really helpful when you can’t dedicate time every day of the week. It is a sad feeling every time I write the date and the year in the title of these posts. I look back and think wow I am still trying to get this one exam done! I am wondering if CCIE Pursuit is still searching for me on Google (upper right hand corner?) Anyhow here I am still am crawling along. Since Monday I have finished Switching, RIP, and EIGRP from INE’s Workbook 1. I should be able to get through OSPF tomorrow. BGP is going to slow me down though. BGP is where I started to get into trouble on my lab attempt in October and it just snowballed from there 😀 Some of this stuff I am just having trouble getting my head into. I either waited too long to start back up, or not long enough. I am just dreading getting into more of the new topics it feels like they just dumped onto a huge pile already. I am preparing to go through both my INE and Narbik labs once I get into my weak areas like advance BGP. I think I was in too much of a rush to move through the topology labs and into the full labs last time. Now you toss in the complication of the troubleshooting section and you have to wonder how do you fit that in to the mix? I like how Ivan thinks!